I've been trawling the web for a decent winter road bike and couldn't find better than this bad lad from Tweeks cycles. Stunning value road bike with branded components throughout a light & stiff alloy frame and carbon fork, all for just £299 sheets!! (£200 off the rrp) just had mine delivered this morning its stunning, once I've fitted my crud guards it will be a perfect winter commuter, its so good I might even get my mrs one for xmas! Just looked at the specs.....wheels look like a week point to me? Jalco DRX 20 Aero Rims On Formula Hubs . Do the experts have any thoughts? Just looked at the specs.....wheels look like a week point to me? Jalco … Just looked at the specs.....wheels look like a week point to me? Jalco DRX 20 Aero Rims On Formula Hubs . Do the experts have any thoughts? Reliability is our number one priority for the wheels on bikes at this price, weight being the sacrifice. GT comes up trumps with a sturdy wheelset comprising 32 spokes front and rear (crossed three times – nothing fancy, just sensible) and hubs from Formula – a Taiwanese giant that builds hubs for hundreds of other brands. High-quality 25mm Continental Ultra Sport II tyres finish the package in style: far more voluminous than the 23mm tyres that were the norm until fairly recently – they roll quickly and give extra comfort and grip, both for braking and cornering." ​Wheels are always the weakest point on any bike. Unless you spend more than £4k. That's why they're the first upgrade for many. Wouldn't the b'twin triban 500 from Decathlon be better than this? Same price but fantastic reviews. Wouldn't the b'twin triban 500 from Decathlon be better than this? Same … Wouldn't the b'twin triban 500 from Decathlon be better than this? Same price but fantastic reviews. Hi, wondering if anyone can tell me if this would be an ok entry bike for someone commuting to work on the following route. The 500SE does however and generally is the one hailed. It does have a carbon fork. It's actually the Triban 500SE. Own one myself. Fantastic bike for the money. interestingly this is 24 speed, whereas the GT appears 16 speed? I would say the B'Twin is a better buy. 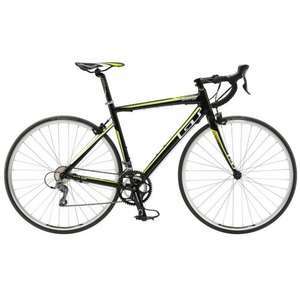 … http://www.decathlon.co.uk/triban-500-se-road-bike-black-id_8306187.htmlinterestingly this is 24 speed, whereas the GT appears 16 speed? I would say the B'Twin is a better buy. Just means the BTwin is a triple and the GT is a double or compact chainset. Difference will be a few quid. Unless you're climbing serious hills on it then you don't need a triple. The Raleigh I linked above I think is better value than both. You're doing what I always end doing. This is just £25 more......ooooh but this ones just £30 more than that........ Oooh but this ones even better and only another £25 more than that one. I used to worry more about things like Claris vs Sora, but have learnt that a lot is also down to the frame, its geometry, and how it fits you. Components can be changed / upgraded over time, whereas you're stuck with the frame. Heat added as this does look like a great deal (though the Triban and Raleigh bikes also look like great value). Hi, wondering if anyone can tell me if this would be an ok entry bike for … Hi, wondering if anyone can tell me if this would be an ok entry bike for someone commuting to work on the following route.https://www.flickr.com/gp/39177554@N03/G4601TI imagine the tyres may need to be replaced as some of the ground on the cycle route is trail...Any advice is appreciated. I used to worry more about things like Claris vs Sora, but have learnt … I used to worry more about things like Claris vs Sora, but have learnt that a lot is also down to the frame, its geometry, and how it fits you. Components can be changed / upgraded over time, whereas you're stuck with the frame. Heat added as this does look like a great deal (though the Triban and Raleigh bikes also look like great value). why is it a winter bike ? When did bikes become seasonal ? is it more waterproof? or has a heated saddle and handlebars ? nope ! Bought this last week and it's just arrived - can't wait to take it out. I managed to get it for £277.18 after cashback and a voucher code - absolute bargain! why is it a winter bike ? When did bikes become seasonal ? is it more … why is it a winter bike ? When did bikes become seasonal ? is it more waterproof? or has a heated saddle and handlebars ? nope ! I agree this "Winter Bike" thing seems just like an excuse to purchase more bike. PS: Moderator, can you tell me why my posts are subject to review before being posted? Deal posting newbie! This is grahamohara2 first deal post. Help out by leaving a posting tip or just to show your appreciation for their contribution.